Family fun, great food, and adventure awaits young readers in Hot, Hot Roti for Dada-ji by F. Zia. Aneel’s grandparents have come to live with them, all the way from India. One day, Aneel is eager to hear a story. His Dada-ji (paternal grandfather) tells him the story of a young lad from a village who wrestled water buffalo, tied cobras together, and spun elephants. His strength came from his Badi-ma’s (great grandmother’s) hot, hot roti that “sizzled and wizzled” on her wood hearth. So Aneel decides to whip up a batch of hot, hot roti for Dada-ji to see if he still has the strength of that lad. If only he knew how to make them. This is a touching book of family, food, and fun. Young readers get a taste of a family together, enjoying each other’s company, and experiencing new adventures together. The love between Aneel and his dada-ji is evident from the start. Aneel eagerly seeks out his dada-ji to tell him a story, reminding young readers of the importance and pleasure of listening to a more experienced generation. The conflict for Aneel comes in a bit later into the book, when he decides that his dada-ji must have a stack of hot, hot roti, but everyone else is too busy to make them. Not easily deterred, Aneel begins trying to make his own batch, which draws the rest of his busy family into the kitchen. The artwork of Ken Min is beautiful in Hot, Hot Roti for Dada-ji. The pictures and the colors capture the family’s culture. Some of my favorite illustrations come from when Dada-ji relays his story of the young lad in the village, but the most touching are the scenes of Aneel and his dada-ji at the end after they’ve eaten their hot, hot roti. Included at the back of the book is a glossary of terms. I found this very helpful. 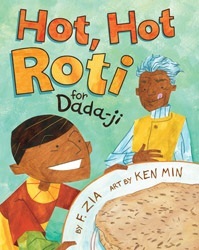 Young readers will flip for Hot, Hot Roti for Dada-ji by F. Zia! 1. Leave a comment with your email address for your chance to win. You can’t win if we don’t have your email address. Contest is open to residents of the United States only. Deadline for entries is 11:59 PM on June 27, 2011. A winner will be selected from all correct entries received. The winner will be notified by email and will have 72 hours to respond with mailing information. If we do not hear from the winner within the 72 hour time frame, a new winner will be selected. A copy of this book was sent to me by the publisher in conjunction with the author’s virtual blog tour. This review contains my honest opinions, for which I received no monetary compensation.